Current settings of the white search form on top: check for luxury and premium cars at the 'Graz - Airport' rental location. Address: Verkaufskoje, Graz Airport, Graz, E3.06/03, Austria. 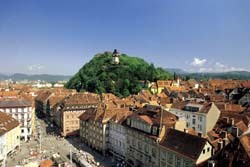 OrangeSmile.com offers 2 rental locations in Graz for your choice. - Use the map of Graz on the left. General information. OrangeSmile.com offers premium class vehicles and limousines with best rate guarantee. Having a wide choice of rental providers in Graz, we show you the most beneficial offers on the fly, based on your search criteria. The most typical car models in the luxury and premium segments in Graz are: BMW X3, Mercedes SLK, Mercedes C Class, Lexus ES, BMW X5, Audi A5 Sportback and others. A vital characteristic of all limousine offers in Austria is a high insurance deposit (franchise). Please read the rental conditions of a selected model prior to your booking. In addition, for a luxury saloon rental offices in Graz may request information about two credit cards. It will also be indicated in your rental conditions. At puck-up time in the office, do not forget to verify the given papers and compare them with your voucher. Sometimes, rental offices in Austria try to add optional services without notifying customers. Having accepted the car, read through the vehicle manual and also examine all noticeable exterior defects (e.g. scratches). If found, check that they are mentioned in your rental documents. We wish you safe driving around Austria! Children under 12 years with the height of less than 150 cm can be transported only in a special child seat. It is important to check that the seat is fully consistent with the child's weight and height. Railroad crossing is considered a zone of higher danger, so it is forbidden to overtake closer than 80 meters to the railroad crossing. If you fail to follow this rule, the fine for this violation will be 70 euro and more. Public transport has a number of privileges on the roads of Austria. This is particularly true for school buses. Car drivers cannot use special lanes for public transport. It is also prohibited to overtake buses when they have the warning lights turned on (when loading and unloading passengers). In Graz, visitors can always try the most popular dishes of Austrian cuisine. For centuries, various meat dishes have been the basis of the regional gastronomic traditions. Every restaurant specializing in the regional cuisine offers not only the traditional Schnitzel and various meat ragouts but also dozens of sausage types cooked on a grill. These meat delicacies have long become popular “street food” that is also available for sale in numerous small kiosks and food carts. As a rule, sausages are grilled. This food remains the most popular snack to beer in local bars. When visiting an upscale restaurant, consider ordering a veal schnitzel. For local chefs, cooking this dish is a very important process that requires much attention. Before the actual cooking, the meat is tenderized thoroughly so it becomes roughly paper thin. After that, the schnitzel is covered with bread crumbs and then fried in a pan. The ready dish is usually served with a fresh vegetable garnish. Chicken is also widespread in local restaurants. The chicken filet is usually fried in soft dough. This dish is quite nutritious and high-calorie, so many local people order such chicken together with a glass of beer. Tafelspitz is one more interesting meat dish that tourists enjoy trying in local restaurants. This is the name for boiled beef that is cooked at least five hours. The meat is served together with nutritious broth that also contains different vegetables. The meat becomes incredibly tender after such a long cooking. Ready Tafelspitz is usually served with apple puree and horseradish.